Welcome to the Paper Money Indonesia site. This website has the objective of being a platform for collectors of any kind of Indonesian and Netherlands Indies paper money. On this site you will find articles with background information, links to many related sites, paper money for sale, and last but not least, new contacts for extending your collection. 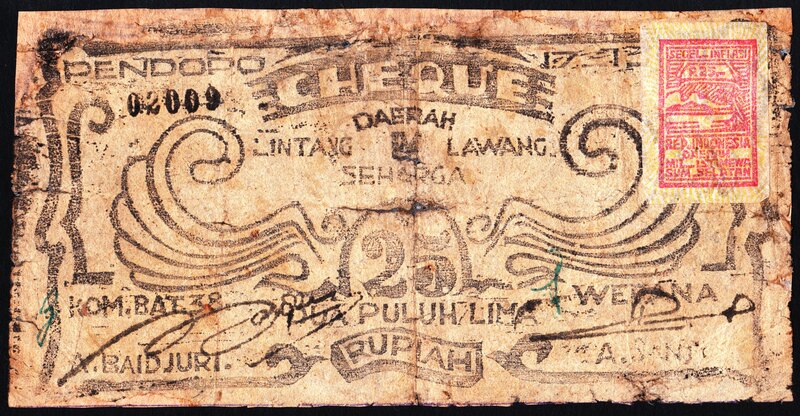 The paper money of Indonesia and it’s colonial past have great attraction to many collectors. Over the past few years the beautiful notes of this archipellage became internationally known and recognized as interesting collectibles. The reasons for collecting paper money are diverse. For some it is an investment, for others it is the beautiful printing or the link with history. Whatever the reason, Indonesia, both now and in the past, offers a wide range of highly attractive paper money notes. Indonesian paper money is part of a lot of collections. Whether it is because of the Japanese rule during WWII for collectors of War or Invasion money, or because of it’s past being a colony. Indonesian paper money also exists in several theme collections like animals, birds, flowers etc. This website aims to share as much information as possible about Netherlands-Indies and Indonesian paper money. During the struggle for independence (1945-1949) the Indonesian region was strongly divided and the monetary situation was very unstable. This resulted in a lot of locally produced and issued paper money by regional and local governmental institutions and even private companies. Until today there is no complete overview of these local issues. With this website we also want to collect and share information in order to get a more clear overview of the paper money of this interesting and hectic period.